Erik Wilde was pointing out the disparities between Google Maps and Google Ditu, or their Chinese version of maps. However, Google Ditu doesn't have satellite imagery. There are several easy ways to fix this. The first was to look at the Ditu tiles, and confirm they are the same as Google's nominal tiling scheme. Which means you can add the China Street tiles as a simple GTileLayerOverlay with Google Maps standard satellite view underneath. This was incredibly easy with Mapstraction and I put up a demo here. For bonus points I even added a Mapufacture syndicated feed of Erik's venues for LocWeb2008 and nearby Wikipedia articles from Geonames. The terms of how mixing Google's various tiles together isn't clear. So the other way to address his issue is to use the freely available data. 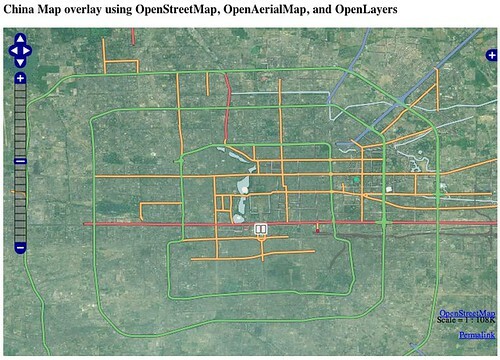 Namely, OpenStreetMap for roads, OpenAerialMap or other remote imagery, and run in OpenLayers. Here is the same map done with open data and open source. The resolution or completeness isn't there yet, but you can see where it's going and the ability to be use the information as you want is very appealing.